A lodge should be an escape from the everyday, providing new experiences along with a healthy dose of peace and tranquillity. That’s why our lodges at Newquay rank among the best. 11 world-class beaches lie on the doorstep, ideal for carefree hours lounging on the sands or surfing and paddleboarding adventures. 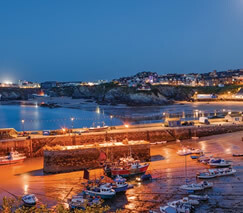 And with Newquay just 3 miles away there’s an unending supply of seaside entertainment to enjoy – imagine all the new extra-special family memories you’ll make. And you’ll feel right at home here on the coast, as our lodge-style homes offer stylish interiors and modern features. Your new ever so laid-back lifestyle begins here. Newquay, Padstow, St Ives… Cornwall’s coastline offers endless entertainment, while your new ultra-comfy holiday home makes the ideal year-round retreat. Sunshine, surfing and seaside charm. Experience the best of Cornwall. 11 beautiful beaches and Newquay are only moments away. 3 outdoor pools, 4 playgrounds, a 9-hole pitch ‘n’ putt… spend countless hours enjoying the on-site facilities. Spacious, cosy lodges mean you can enjoy your downtime in style.